From interactive programming to creating on-the-go wearables, you can do it all with Circuit Playground Express, the multi-purpose learning and development board that's perfect for DIY electronics newcomers. 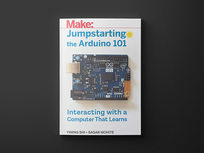 In this beginner-friendly eBook, you'll learn how to get up and running with this board and utilize its built-in sensors for a number of interactive projects. You'll come to understand the basics of coding in multiple programming languages and learn how to create your own IoT programs. Mike Barela is currently a consulting engineer for Adafruit Industries, LLC. He recently retired as a senior Foreign Service officer and security engineer for the U.S. Department of State. Mike is a graduate of Whitman College in mathematics/physics and the California Institute of Technology in electrical engineering. He has also worked at Hewlett-Packard, the Caltech/NASA Jet Propulsion Laboratory, and Boeing. An avid electronics enthusiast, he started with a workbench and Radio Shack parts in high school. 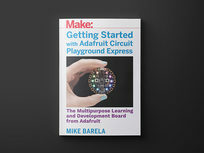 Mike is the author of the book Make: Getting Started with Adafruit Trinket and many tutorials on the Adafruit Learning System. 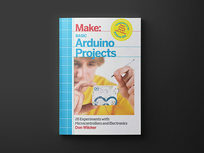 Make: Basic Arduino Projects is the companion book to the popular Ultimate Arduino Microcontroller Pack and details over 25 different projects to get you channeling your inner tinkerer. Using the Ultimate Arduino Microcontroller Pack (not included) or equivalent hardware, you'll walk through creating multicolor flashing lights, timers, tools for testing circuits, sound effects, motor control, and more exciting DIY projects. Note: You will need the Ultimate Arduino Microcontroller Pack or equivalent hardware to work on the projects in this book. Make: is the magazine for Makers, which was first published in 2005 and used the word “Maker” to name the community. Now in its 13th year, Make: is published bi-monthly in print and features dozens of DIY technology projects. Called the “bible” for makers, Make: and its companion website, Makezine.com, cover makers, their projects and technologies as well as the communities that grow up around them. 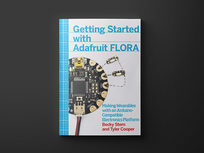 Getting Started with Adafruit Flora is your beginner-friendly guide for building wearable electronics projects using Adafruit's FLORA board. 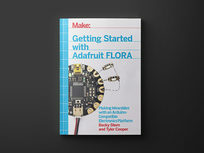 Written by Adafruit's Director of Wearable Electronics and Creative Engineer, this eBook is your definitive introduction for creating DIY electronics with this computing platform. 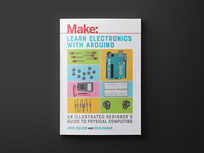 You'll learn how to plan your wearable circuits, sew with electronics, and much more as you make your way through this eBook. Becky Stern is the Director of Wearable Electronics at Adafruit. Each week, she publishes a new do-it-yourself craft/tech project tutorial and video and also hosts the YouTube Live show "Wearable Electronics with Becky Stern." She's been combining textiles with electronics since 2005, and helps develop the Adafruit FLORA wearable Arduino-compatible product line. Tyler Cooper is a Creative Engineer at Adafruit. He is part of a small team that is responsible for designing and developing Adafruit Learning Technologies, including the best learning system in the world. Tyler has been designing and developing web applications since 2003 and has been engineering open-source hardware since 2008. 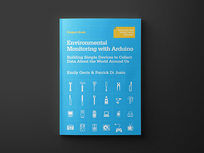 DIY Environmental Monitoring with Arduino is your wall-to-wall guide for using Arduino to create devices that can measure noise, weather, electromagnetic interference (EMI), water purity, and more environmental factors. You'll learn how to collect and share your findings with the world, and you can also create your own variations of the projects included in this eBook. And, no worries if you're new to programming: the first chapter has you covered with a primer on electronic circuits and Arduino programming. Emily Gertz is a correspondent for OnEarth Magazine. She has been covering DIY environmental monitoring since 2004, when she interviewed engineer-artist Natalie Jeremijenko for Worldchanging.com. Her latest, on citizen radiation monitoring in Japan, was published by OnEarth Magazine in April 2011. Patrick Di Justo is a contributing editor at Wired magazine, where he writes the magazine's monthly What's Inside column, and the author of The Science of Battlestar Galactica (Wiley, October 2010). His work has appeared in Dwell, Scientific American, Popular Science, The New York Times, and more. What better way to dip your feet into the inventive world of Arduino than by learning from its co-founder? 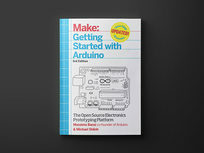 Co-authored by Arduino co-founder Massimo Banzi, Getting Started with Arduino: 3rd Edition contains everything need to know to get started with this amazingly popular open-source electronics prototyping platform. You'll learn from detailed, hand-drawn illustrations and flex your newfound knowledge with guides for two hands-on projects! Massimo Banzi is the co-founder of the Arduino project and has worked for clients such as: Prada, Artemide, Persol, Whirlpool, V&A Museum and Adidas. He spent 4 years at the Interaction Design Institute Ivrea as Associate Professor. He spent many years working as a software architect ,both in Milan and London, on projects for clients like Italia Online, Sapient, and Labour Party. Michael Shiloh is Associate Professor at the California College of the Arts where he teaches electronics, programming, robotics, and electromechanics. Trained formally as an electrical engineer, Michael worked for various consumer and embedded engineering firms before discovering a passion for teaching. Netduino is an open-source electronics platform based on the .NET Micro Framework, and it's quickly becoming a popular pick among DIY electronics gurus due to its improved computing power. Getting Started with Netduino: 1st Edition provides step-by-step guidance for experimenting with Netduino and the .NET Micro Framework. Following along a number of quick projects, you'll learn how to create networked devices that communicate over TCP or IP. Chris Walker is the inventor of the Netduino, host of the Netduino user community, and an expert on .NET Micro Framework. Blending the ease-of-use of Arduino's classic boards with powerful hardware, the Arduino 101 is the logical next step forward for any tinkerers looking to expand their creative potential. Jumpstarting the Arduino 101 offers a comprehensive look at using this board to its full potential. Jump in, and you can get started with this platform as you explore neural net pattern matching, gesture recognition & more of its exciting features. Filled with color illustrations, easy-to-follow explanations, and step-by-step instructions, Learn Electronics with Arduino is the perfect starting point for creating your own projects on the Arduino platform—no experience required! You'll get a solid introduction to basic electronics theory and programming concepts, as well as digital and analog inputs and outputs, so you can start building circuits, writing sketches, and more with Arduino. Jody Culkin is an artist and teacher. Her comic, "Arduino!" has been translated into 12 languages and her illustrations have appeared in Make magazine. She has received grants and awards from the National Science Foundation, the New York State Council on the arts and many other organizations. She is currently a Professor at CUNY's Borough of Manhattan Community College in the Media Arts and Technology Department. Eric Hagan is an interactive and kinetic artist and professor based out of Astoria, NY. He has written articles for publications including Make: magazine and Popular Science. He has also worked on several art installation projects around New York City including the annual holiday windows on 5th Avenue and Kara Walker's A Subtlety. He is currently a Professor at SUNY Old Westbury in the Visual Arts Department. Learn how to build devices with both the Lego Mindstorms NXT 2.0 and the Arduino prototyping platform in this beginner-friendly guide! 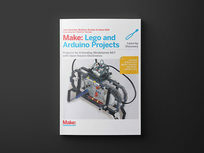 Make: Lego & Arduino Projects: 1st Edition shows you how to bring Arduino functionality to the Lego Mindstorms kit, allowing you to create everything from a drink dispenser to a music synthesizer and wireless lamp. Following along step-by-step instructions and clear illustrations, you'll get your feet wet building a number of projects for this exciting platform. 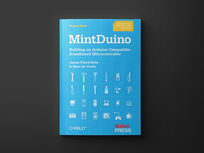 Assemble an Arduino-compatible micro-controller and build a complete MintDuino project from start to finish with this step-by-step eBook. DIY MintDuino: Building an Arduino-Compatible Breadboard Micro-Controller has you channel your inner creator by making a MintDuino reflex game. You'll walk through all the necessary steps for wiring up and programming the MintDuino controller, and get the skills to start working on your own MintDuino projects. Jim Kelly was accepted into the LEGO MINDSTORMS Developer Program (MDP) in early 2006 and helped to beta test the LEGO MINDSTORMS NXT kit and software. He is a member of the MINDSTORMS Community Partners, a group that continues to assist LEGO with testing and growing the NXT product. 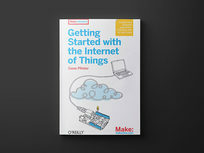 From our smartphones to self-driving cars, we're surrounded by Internet of Things (IoT) devices, and you can start making your own with this easy-to-follow eBook. Getting Started with the Internet of Things walks you through using micro-controllers to interface with the real world. 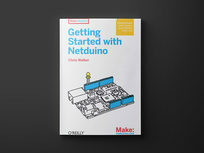 Using a Netduino Plus micro-controller, you'll learn how to build a web server, send sensor data over the web, and much more as you make your way through this eBook. Dr. Cuno Pfister studied computer science at the Swiss Federal Institute of Technology in Zürich (ETH Zürich). His PhD thesis supervisor was Prof. Niklaus Wirth, the designer of the Pascal, Modula-2, and Oberon programming languages. Dr. Pfister is the Managing Director of Oberon microsystems, Inc., which has worked on various projects related to the Internet of Things, from mobile solutions to a large hydropower-plant monitoring system with 10,000 sensors. Many aspiring hobbyists shy away from using Raspberry Pi and similar platforms because they require understanding Linux. However, the reality is that Linux isn't all that difficult to understand—especially when you have an expert walking you through it. 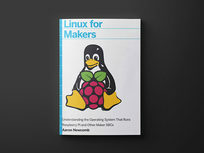 From loading the OS to troubleshooting and prepping projects, this beginner-friendly guide walks you through the Linux OS and how you can add its open-source power to your own DIY electronics projects. Aaron Newcomb has been a maker since he was old enough to hold a screwdriver and has been using Linux since 1997. He currently works in the IT industry and co-hosts several shows about technology for TWiT, LLC, including FLOSS Weekly, All About Android, and This Week in Google. In 2012, he founded Benicia Makerspace where he currently serves as President and Executive Director. Compact, economical, and Arduino-compatible, the Adafruit Trinket is a brilliant platform for DIY electronics hobbyists to get their feet wet in the field. Getting Started with Adafruit Trinket walks you through the essentials of using this board and offers a number of hands-on projects to refine your skills. Inside, you'll find over 15 projects for the AVR ATtiny85 Board. Mike Barela is an Engineer, Maker, innovator, and a Senior Foreign Service Officer with the US Department of State. A graduate of Whitman College and the California Institute of Technology in Electrical Engineering, he has worked at Hewlett-Packard, the NASA Jet Propulsion Laboratory, and Boeing. He's traveled the world, living in a number of countries providing security to American Embassies. An avid electronics enthusiast, he has worked on computers since the introduction of the PC. The air is filled with all sorts of gases and substances invisible to the naked eye, but you can detect and measure them through the power of Arduino! 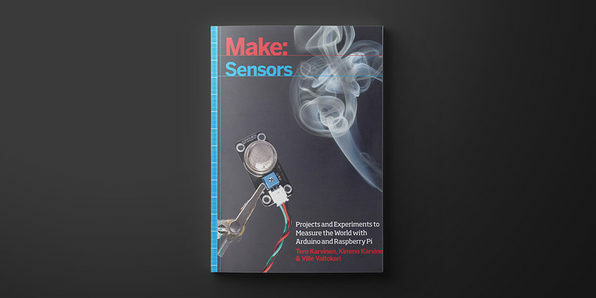 With easy-to-follow tutorials and step-by-step instructions, this eBook will show you how to create gadgets for examining the quality of the atmosphere. Emily Gertz is a journalist and editor covering the environment, wildlife, and science. She currently works at TakePart.com, the digital news arm of Participant Media. Prior to joining Participant in late 2014, she was a longtime freelancer for both online and print publications including The Guardian, Popular Mechanics, OnEarth, and others. Patrick Di Justo wrote the popular Wired magazine column What's Inside and is an editor at Make: magazine. A contributor to The New Yorker's science blog, Elements, he also writes for The Atlantic, Popular Science, and Dwell, among others. He has also designed experiments for NASA, worked as a robot programmer, and done stand-up comedy. He once walked on the outside ledge of the 72nd floor of the Empire State Building for a story. 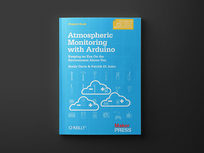 Whether you want to build an intruder detector or weather monitor, you'll going to have to get savvy with sensors if you want to create an Arduino project that interacts with the physical world. 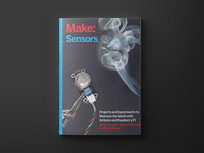 Complete with a wealth of high resolution imagery and delivered in a friendly, understandable tone, Make: Sensors 1st Edition offers an introductory overview of how to use the myriad of sensors on the market in your own Arduino projects. Tero Karvinen teaches Linux and embedded systems in Haaga-Helia University of Applied Sciences, where his work has also included curriculum development and research in wireless networking. He previously worked as a CEO of a small advertisement agency. Tero's education includes a Masters of Science in Economics. Kimmo Karvinen works as a CEO in a leading company specialized in AV automation in Finland. Before that, he worked as CTO for a hardware manufacturer that specializes in smart building technology, as a marketing communications project leader, and as a creative director and partner in advertisement agency. Ville Valtokari works as the head programmer for automation hardware manufacturer. Before that he designed and programmed cutting edge AV systems. Countless personal projects include game design and programming, building robots, and discovering how things work.